Do you need more replicas? Will more disks yield increased database performance? 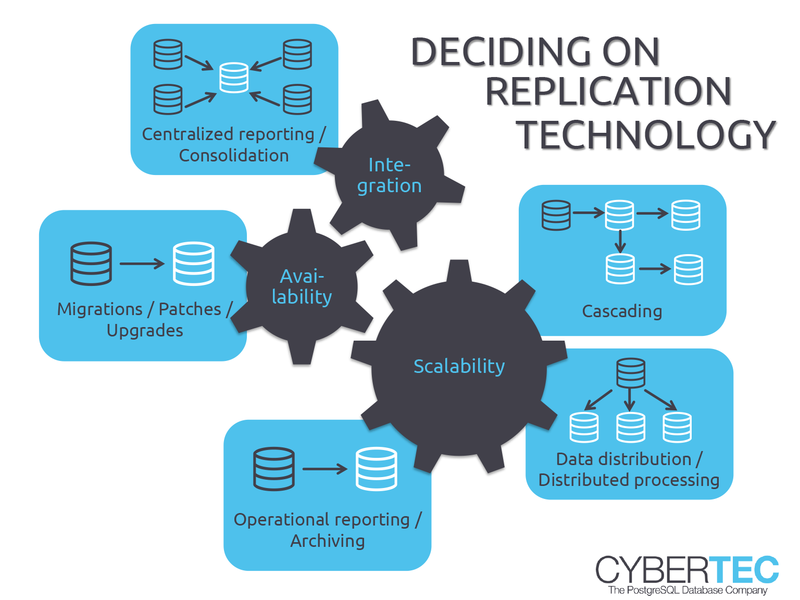 Which replication technology shall be used? What is the ideal size of a server and how much RAM should there be? Those are typical questions asked by customers around the world running PostgreSQL. We have all the answers to those questions and we are more than willing to share them with people around the world. The PostgreSQL ecosystem offers many different solutions to database replication and data distribution. Many features were added by the PostgreSQL community over the years. To give you an impression of the scope of PostgreSQL replication capabilities we want to provide you with a small but telling example: “PostgreSQL Replication, 2nd edition” is a book released by PACKT Publishing, which is exclusively about PostgreSQL replication and backup security. Even 350 pages are not enough to cover everything related to replication. A book of this size only scratches the surface and is by far not complete. From our point of view this says something about the number of features PostgreSQL provides and which incredible power there is at your fingertips. Deciding on the right replication technology is not easy. What is better for you? Synchronous replication? Asynchronous replication? What is the ideal tool to achieve High-Availability? Is it better to use Pacemaker, Corosync, etc. or is it better to deploy the Patroni toolchain? We can help to decide on the right PostgreSQL replication solution. We will work with customers to find the right solution to those problems and provide consulting to achieve the desired goals. Deploying a large scale, PostgreSQL server infrastructure requires some thinking. Often the question is whether to use real hardware or fully virtualized systems. Even if the entire infrastructure is fully virtualized, deciding on the underlying hardware is still an important aspect of system design. Cybertec will help you to decide on the right infrastructure. We can even help you to find the right cost effective hosting partner or cloud provider. Cybertec has dealt with all major hosting players and has a lot of experience in the field of cloud computing. In case you are aiming for real physical hardware, things such as the RAID level make a real difference. RAID-5 does not deliver the same performance as, for instance, RAID-10. The same applies to filesystems. Not all filesystems are equally fast and equally suitable for good database performance. COW filesystems such as “btrfs” tend to be considerably slower than classical filesystems such as XFS and ext4 in the long run. Achieving maximum performance on physical hardware and virtualized systems needs some thinking and we can provide you with all the expertise necessary to maintain customer satisfaction. Storage and replication are not the only areas in which proper design and system architecture matter. Database security is more than a “buzzword”. No company can afford to lose data or to find its secret information published somewhere on the Internet. Do you still remember what happened when thousands of MongoDB servers were held for ransom recently? Paying ransom is not a nice thing to happen to a company. While good security is definitely a plus of PostgreSQL over obviously bad systems such as MongoDB, security concerns must not be taken lightly. 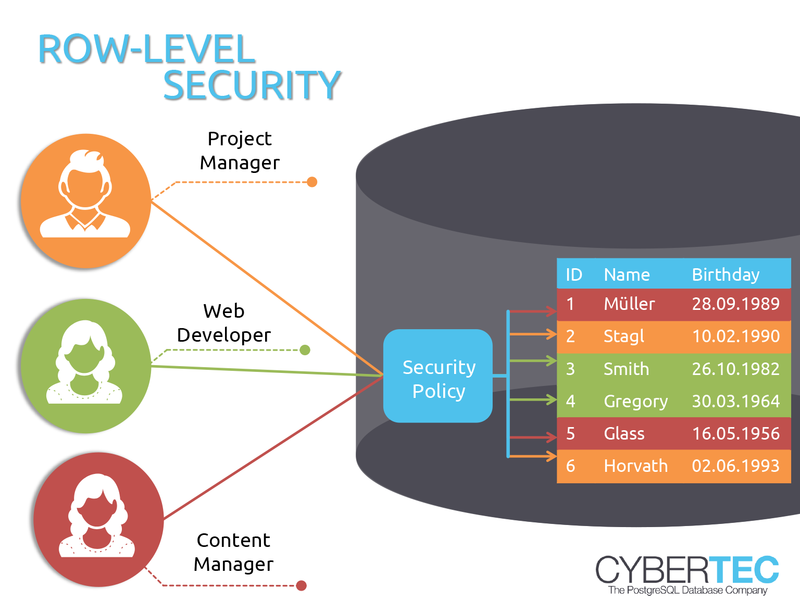 The way your database system is designed has a major impact on the overall security of your entire software stack. Therefore it makes sense to consider SSL, “Row Level Security” (RLS) or even more advanced techniques such as “SELinux for PostgreSQL”. Having a clear and well-thought-out security policy really does pay off and helps to keep your data safe. If you want to make your systems safer or if you just want to a database review, our professionals are here to help. Contact us for further information. There has been an ongoing discussion about whether to run a single, large database instance or many small database instances for many years. In fact, this discussion has been around since the beginning of the PostgreSQL era. What kind of hardware are you running on? What is the desired workload? Which requirements are there on the I/O size? Who is allowed to access the database? We can help you to come up with the ideal design and set up your systems.